In this particular work A.W. 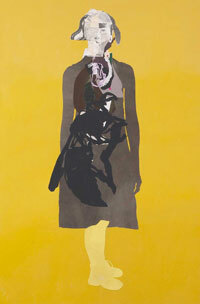 of K. stands for ‘a week of kindness’, the image of a bee superimposed over the portrait of a woman. The view is simultaneously internal and external. Are we to compare the tireless effort of the worker bee to the never ending ‘weeks of kindness’ undertaken by women in the domestic environment? The unseen effort of the worker bee who serves the queen bee? Smart also revives, renews and re-contextualises many of the so-called ‘women’s arts’ of the past…needlework, embroidery, quilting, patchwork, sewing, while simultaneously allowing the unexpected, the random association and the sub-conscious to surface in what is contemporary art practice. Sally Smart was born in Quorn, Flinders Ranges, South Australia (1960) and studied at the South Australian School of Art, Victorian College of the Arts and at Monash University. She has established a reputation as one of Australia\’s leading feminist artists with over twenty solo exhibitions to her credit, and has also featured in a number of significant international touring exhibitions. Her works are represented in numerous public collections, including the National Gallery of Australia, The National Gallery of Victoria, the Museum of Contemporary Art, Sydney, Queensland Art Gallery, Geelong Art Gallery, Bendigo Art Gallery and the Mornington Peninsula Regional Gallery. She is currently based in Melbourne.